Mowers Direct Announces Best Reel Mowers. Top Rated Hand Push Reel Mowers Recommended. MowersDirect.com announced today their recommendations for reel mowers. It's hard to get an honest, straight-forward recommendation anymore, especially when it comes to push reel mowers. Most retailers are loyal to whatever is on their shelves, according to Jon Hoch, founder & CEO of Power Equipment Direct - one of the fastest growing e-commerce companies in the United States. MowersDirect.com, however, isn't your ordinary retailer. The online superstore specializes exclusively in lawn mowers and carries more than a 100 types of lawnmowers from over a dozen leading brands. The online retailer combined retail prices, recent sales history, customer reviews and personal insight to generate their final lawn mower recommendations. Once the dust and data settled, 3 push reel lawn mowers sold by MowersDirect.com were given their prestigious "Recommended" status. 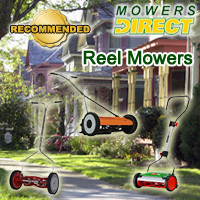 By providing the recommendations and reviews, MowersDirect.com hopes to arm shoppers with enough ammunition to pick the perfect reel mower for their needs.